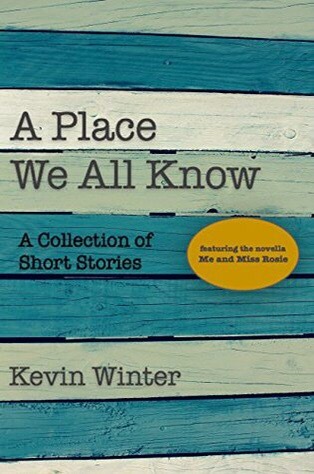 In A Place We All Know, Kevin Winter has compiled seven of his most vivid and engaging short stories, each firmly rooted in the culture and character of north Mississippi. There’s something for everyone here, as the author immediately plunges you into the immersive environment of the fictitious town of Millwood Branch and Hickahala County in his most expansive exploration of that world to date in Me and Miss Rosie. Commercial airline pilot Eric Johnston is a man searching for a home, a place in which he can attempt to piece back together his fractured life. In Millwood Branch, he not only finds a forever home, but also a very unlikely friend that helps him navigate a course of healing, self-forgiveness, and redemption. This charming and indelible novella has never before been made available and is exclusive to this lovely collection of short fiction. And there’s more here to enjoy. Come meet the tragic and resilient Lana Jones Carmichael in Goodnight Young Miss Lana Jones, a story that brings to life the idea of undying love. In From the Backs of Four Shop-Rite Bags, you’ll meet the hilarious, incomparable Maude McBeene as she leads a backwoods attempt to avoid a catastrophe of worldwide proportions. The scenery pulls you right into these unforgettable characters’ world. You can almost feel yourself driving on the gravel surface of Bullfrog Road or hiking up on Muddy Pine Ridge. Whether you’re looking for something quick and light to read in your easy chair or front porch swing or a long read to get you through that beach vacation, you’re sure to find a story here to fit the bill. This is a read to savor. Just sit on your porch or your favorite reading spot, sip sweet tea and lose your self in the tales of the south. Most of you know…I am not a huge fan of short stories. This book has changed my mind! Each tale is different and unique. Every character is rich and appealing. If you know the south at all….we definitely have our “characters”. I see many “real-life” people in these stories. This just made each story so legitimate to me. I could just picture the people and the scenery. My favorite is Me and Miss Rosie. I think this one should be a novel. Miss Rosie is a treat! She is very much like many older southern belles…in other words, a little ornery, opinionated and demanding. I also enjoyed Goodnight Young Miss Lana Jones. This one is very sorrowful and heart wrenching. I told you each story was unique…there is also one about zombies….so something for everyone in this collection. Kevin Winter is extremely talented and I look forward to many more stories from this young man! Just a few quotes I loved! Kevin Winter lives and writes in north Mississippi. His short stories have appeared in numerous online and print publications including Bartleby Snopes, The Medulla Review, Pantheon Magazine, The Battered Suitcase, and The Dead Mule School of Southern Literature. He and his wife, Haley, have two boys, Hudson and Jake, and one rescue dog named Charlie. With his writing, Kevin hopes to highlight the warmth, charm, and uniqueness of his home state and to give back to the place that has given so much to him and his family. Currently, he is marketing his collection of short fiction, A Place We All Know, and working on his second novel, The Two Black Hands of James Carter McMann, to be set in the compelling world of Hickahala County, Mississippi. This entry was posted in Reviews and tagged fiction, kindle, nook, reviews, short stories. Bookmark the permalink. Hi Reeca, I had to pop right over and order this book. Short stories are not my first choice as I much prefer novels, but I can’t resist a good short story either. Have a wonderful weekend. I don’t know where this week has gone; it seems like it just got started and it’s over. Hugs.